"Post Office Box" redirects here. For the electrical device, see Post Office Box (electricity). In some regions, particularly in Africa, there is no door to door delivery of mail; for example, in Kenya. Consequently, renting a PO box has traditionally been the only way to receive mail in such countries. However, some countries, like Egypt, have introduced mail home delivery. In the United States, the rental rate used to be[when?] uniform across the country. Now, however, a postal facility can be in any of seven fee groups by location; in addition, certain customers qualify for free box rental, usually because the Postal Service does not offer carrier-route delivery to their physical addresses. The quantity of post office boxes in a station varies widely. Stations of small areas are often equipped with fewer than 100 boxes, while stations in a central business district (CBD) area may offer a combined quantity of over 200,000 post office boxes. Post office boxes are usually mounted in a wall of the post office, either an external wall or a wall in a lobby, so that staff on the inside may deposit mail in a box, while a key holder (some older post office boxes use a combination dial instead of a key) in the lobby or on the outside of the building may open his or her box to retrieve the mail. 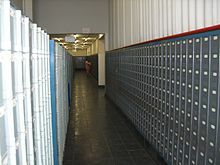 In many post offices in the U.S., the PO box lobby is separate from the window-service lobby, so that the former may be kept open for longer hours or around the clock, while the latter is locked after business hours. In the U.S. since the 1980s, in cities and large urban areas, post offices have tended to close box lobbies overnight because of the tendency of homeless people to use them for sleeping quarters. As a result, some box lobbies are accessible after hours by customers who are provided a code to a door keypad. In addition, some post offices are located in rented facilities such as shopping malls. As a result, PO boxes can only be accessed while that facility is open. If a parcel does not fit in a PO box, the postmaster will leave a note advising that customer to pick up that parcel from the counter. In some post offices, a key will be left in the PO box that corresponds to a larger, locked box (parcel locker) where the patron may pick up his or her package if a signature is not required. Most often, in this case, once the key is used to open the larger, locked box, the key cannot be removed again by the patron, but the door cannot be secured either. Notes will also be left in the PO box in respect of cash on delivery (COD) and registered mail that has to be signed for. In 2011, the United States Postal Service began a pilot program called "gopost" which installed larger boxes to handle package pickup from an unstaffed station. A given box can be used by multiple customers thanks to the integration of a computer which accepts a delivery code. The system uses U.S. Patent 6,690,997, issued February 10, 2004 to Michael A. Rivalto. Deutsche Post started a similar concept called a Packstation in 2001. The privately operated Amazon Locker, started in 2011, is a similar one-time-use pickup (and return) facility for parcels sent to and from the company. Until 2012, package delivery to USPS post office boxes was not available from private carriers like UPS, FedEx and others. In early 2012, the Postal Service introduced a P.O. Box Street Address (PBSA) service that allows box-holders to combine the street address of the post office where their box is located with their post office box number into a street address format. A mailing industry publication called the new service "a great service for people who already have a PO Box and don't want their packages delivered to their home." Users receiving very large quantities of mail can use "locked bags", which are numbered like PO boxes. In the United States, this service is called caller service, and the assigned number is called a caller number, although mail is typically addressed to "PO Box (caller number)." Each country has its own rules and regulations as to how one can retrieve mail at a PO Box. Some countries, such as the United States or the United Kingdom, may require one or more forms of identification. Not all countries offer locked PO Boxes. In the United States, two forms of identification are required when signing up for a PO Box; one of which must be a photo ID. Many countries offer some type of PO Boxes for different uses. There are an increasing number of private companies that provide similar PO Box services to the official postal service privately under the guise of mail forwarding. In Namibia, PO boxes are the only form of mail delivery to private individuals. Even small settlements feature a block of PO boxes for rent. In Windhoek, capital and the only large town, blocks of PO boxes are scattered all over the city and not necessarily located at post offices but at shopping malls, in pedestrian zones or on public places. The South African Post Office has Post Boxes available for rent. These are usually attached to, or close to a post office. In urban areas with PO Boxes for rent there also maybe home delivery of mail. In rural areas Post Boxes are often compulsory as no street deliveries take place. In the area's that there is no street delivery, Post Boxes are not charged for. Boxes and Street delivery postal codes may be the same in an area, or may differ. Private Bags are available for recipients of large mail volumes. Post office boxes in General Post Office, Hong Kong. In Hong Kong, PO boxes are available in two different sizes. They are available in many post offices throughout the territory. In Japan, PO boxes are available at most post office locations. There is no cost to rent a post office box, but the renter must be able to retrieve mail regularly (daily, in principle) from the box. The renter must also rent the box for 6 months or more. In the Philippines, PO boxes are available for rent in selected post offices. PO boxes, also known as lock boxes, are available in three sizes: small, medium and large. In South Korea, PO boxes are available in one size at selected post offices. There is no charge for renting PO box, but renter must fetch mail at least once in 30 days. Application is only available at post office with valid ID, seal for receiving registered mail, and key fee(usually around 10,000 won). Seoul CPO box room is the only PO box in Korea with fully automated mail retrieving system. In Australia, wall-mounted PO boxes come in five sizes: small, medium, large, jumbo and A4. The different sizes boxes can be mixed almost completely arbitrarily on the wall. There is also an option for locked private bag which comes in two different sizes as well: small and large. PO boxes and private locked bags can be combined. In New Zealand, customers have the option to select between two sizes of PO Boxes: small and large. There is also an option to hire a Private Bag similar to "locked bags" in other countries. The annual fee is paid annually in advance. Same as 2., but for businesses, – they are generally available at all post offices throughout the country. Only mail from Austrian Post can be delivered to an Austrian Post PO Box, but there are also private companies offering the same service but for example completely Anonymous or for parcels. In the United Kingdom, anyone applying for a Royal Mail PO box must produce documentation to verify their home or business address. In Canada and the U.S., Postal Boxes are available in five different sizes (A, B, C, D & E). They are generally available in all post offices throughout the country. In the United States, PO Boxes are generally available through the United States Postal Service (USPS). They are usually arranged from the smallest boxes at the top to the largest boxes at the bottom. The two largest sizes may be configured as drawers. To rent a PO Box, two different forms of identification are required. At least one of them must be a valid photo ID. This also applies to others who wish to share the box with the original subscriber's permission, and are of legal age. The post office will not forward mail from a PO Box until the box is closed, and then only to one address for all subscribers. As part of the agreement to rent a PO Box, if the PO Box is used for business, the Post Office will provide, upon request, the geographical (street) address of the business. Until 2012, only items mailed or shipped via USPS could be received at a USPS PO Box. However, a service called Street Addressing has begun to change this. Once a permission form is completed by the box holder, Street Addressing allows private shippers, such as United Parcel Service (UPS) or FedEx, to ship items to a modification of the actual street address of the Post Office where the PO Box is located. The Post Office accepts the item, and places it in the PO Box or, for larger items, handles them the same way they would a package sent via USPS. (Some have storage lockers.) Only certain Post Offices offer Street Addressing, and even for ones that do, it may not be available to all of its PO Box customers (e.g., boxes without a fee). Other restrictions also exist, including the same limitations on items that cannot otherwise be mailed by ground service though USPS. (Not to be confused with items that cannot be shipped by air.) In many cases, the package may require one additional business day for delivery, and the service was never intended for overnight delivery. Also, federal holidays not observed by the private shipper might cause a delay. If an item is shipped using Street Addressing in which the box holder did not properly sign up for, it will be returned to sender. Street Addressing will have the same street address of the post office, plus a "unit number" that matches the P.O. Box number. As an example, in El Centro, California, the post office is located at 1598 Main Street. Therefore, for P.O. Box 9975 (fictitious), the Street Addressing would be: 1598 Main Street Unit 9975, El Centro, CA. Nationally, the first five digits of the zip code may or may not be the same as the P.O. Box address, and the last four digits (Zip + 4) are virtually always different. Except for a few of the largest post offices in the U.S., the 'Street Addressing' (not the P.O. Box address) nine digit Zip + 4 is the same for all boxes at a given location. Private Mail Bag – delivered to recipient by contractor. Post box – used for outgoing mail. ^ "USPS.com® – gopost®". Tools.usps.com. 28 March 2011. Archived from the original on 21 February 2013. Retrieved 24 August 2013. ^ "New Postal Kiosk Will Handle Packages". Potomaclocal.com. 29 December 2011. Retrieved 2013-08-24. ^ "USPS officially announces gopost pilot". Dmnews.com. 27 April 2012. Retrieved 2013-08-24. ^ "Move to Competitive Locations with Street Addressing". Ribbs.usps.gov. Retrieved 2013-08-24. ^ "Street Addressing Now Available For USPS P.O. Box Holders". Giantprintshop.com. 1 February 2012. Archived from the original on 31 October 2017. Retrieved 24 August 2013. ^ "The New Addresses on the Block". Mailingsystemstechnology.com. Retrieved 2013-08-24. ^ "D920 Caller Service". Pe.usps.gov. 3 July 1994. Archived from the original on 29 August 2009. Retrieved 1 October 2009. ^ "Retail Services". PHLPost. Archived from the original on 11 November 2016. Retrieved 9 November 2016. ^ "개인정보 유출걱정은 끝! 우체국 사서함 신청방법/이용방법/이용료 안내" (in Korean). Korea Post. Retrieved 2017-03-19. "우체국 우편사서함 제도~ 그것이 알고싶다!!" (in Korean). Korea Post. Retrieved 2017-03-19. ^ a b Post, Australia. "Post Office Boxes & bags". auspost.com.au. Retrieved 2016-11-09. ^ "PO Box & Private Bags | New Zealand Post". www.nzpost.co.nz. 2015-02-03. Retrieved 2016-11-09. ^ "Postfach". Post.at. Retrieved 2013-08-24.